There have been so few female athletic superstars in recent memory, that the existence of Venus and Serena Williams is an extra dose of incredible. I don’t follow tennis, but in some form or another I have been subconsciously aware of their careers, which seem to extend infinitely, along with their mark on the sport. 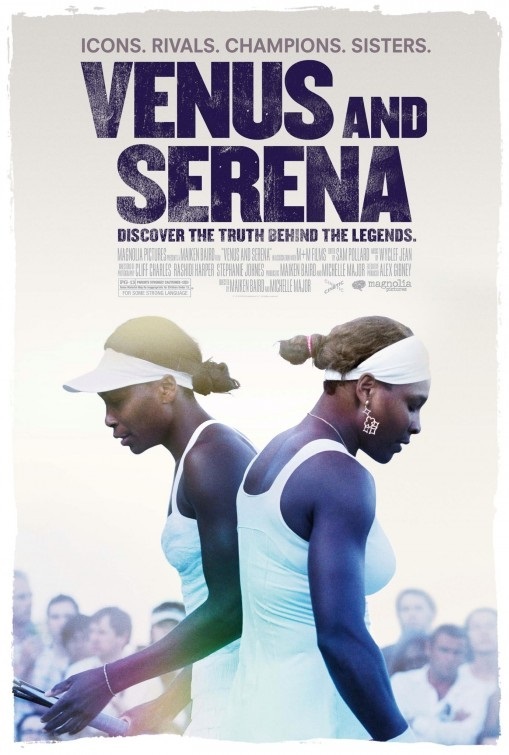 Venus and Serena is a documentary that follows the sisters (though mainly Serena) during the 2011 tournament season and Serena’s struggle with injury and illness. However, the film also spends a lot of time splicing archival footage from the duo’s early beginnings in Compton, their father’s “creative” coaching methods, and their subsequent rise to the top of the international rankings. I would argue that the documentary lacks a fundamental focus, and instead opts to show a superficial overview of both women’s careers. The story is balanced, as we see Serena and Venus at their best and at their worst both on and off the court, but it’s nothing we haven’t already seen debated in the tabloids and on TV. Even the talking heads seem superfluous, as no one in the Williams’ clan is up to the challenge of talking too off script. The most interesting aspect of this film is Serena’s recent battles with her own body, and the brutal advanced aging that plagues many athletes after years and years of being the best. The film ends with quick glimpses of uncharacteristic losses in 2011 but then jumps to 2012 when Serena claimed another Wimbleton title and both sisters picked up gold medals at the London Olympics. Had more time been spent on the emotional toll of the physical setbacks, and its overall impact on the relationship these women have with each other both as rivals and teammates, the more insight we may have garnered about the sport they love. For a documentary about agruably the best female tennis players in history, I feel Venus and Serena misses the mark slightly by not exploring enough about how they changed the face of the sport for women, and more importantly, minority women. Their influence is stated more as a passing fact, than a remarkable achievement worthy of deeper exploration. Venus and Serena is a light documentary that may educate tennis neophytes, and will certainly entertain, but not quite inform, tennis fans. Venus and Serena opens today at the Ritz Bourse.